Mix ingredients in a bowl till well mixed. Spread into bottom of a pie plate or small rectangular baking dish. Refrigerate. 5. Add paste to egg and sugar mixture. 6. Add paste mixture to boiled milk mixture. Cook over medium heat until thick, stirring constantly. Bring to a slow boil, then set aside to cool. 7. Beat egg whites till stiff (the 2 whites you saved). Fold into cooled custard. 8. Pour custard over biscuit base. Refrigerated till firm – at least 2 hours, preferably overnight. 9. 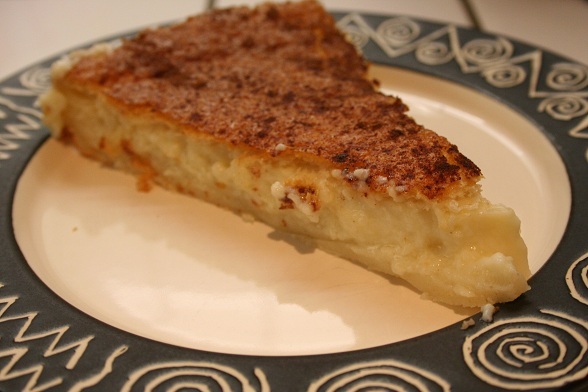 Sprinkle tart with 2 mL/ 1/4 tsp cinnamon before serving. Serve with tea.